Tea is a gateway drug. When I think back to what made me a collector of action figures, records, books, and assorted crap today, I can only blame one thing: Red Rose Tea figurines. 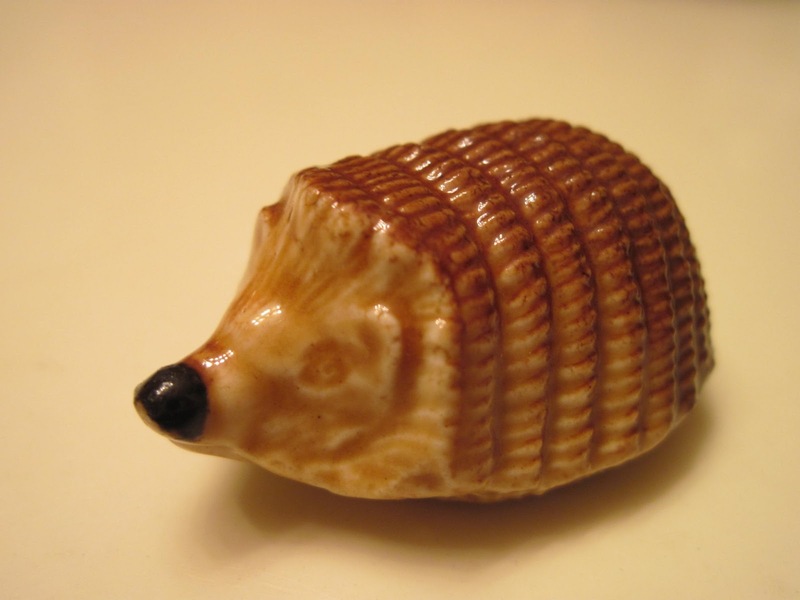 Back in the 60s, 70s, and 80s these figurines (see hedgehog, above) came packed in every box of Red Rose Tea, one per box of 100 (or was it a million?) tea bags. So, as a kid, it was your task to drink as much caffeine as possible in order to "collect the whole set." Red Rose Tea has a helpful history of the figurines on its website, in which we find out that they're from George Wade Pottery in Burslem, England, which first produced them for Red Rose Tea in 1967 (the year of the Lord, it being my birth year), and that they're actually called "Whimsies." How whimsical. "Nearly all Red Rose Figurines, with the exception of the very first, have one significant feature: fine moulded parallel ridges on the underside of the base. It now seems to have become a "trademark" for all Wade "Whimsies" to follow, making them remarkable Red Rose collectibles." Whatever. All I cared about was getting all of them - a perfect example of sales driven by sales promotions, in this case a premium ("something free"). Kids are particularly susceptible to premiums, hence the free, plastic toy in the box of Frosted Flakes and the non-edible parts of the Happy Meal. Oh, yeah, that would be all of it. You get the idea. I developed a serious tea habit. Before I knew it, I was hanging out at seedy, all-night tea dens, snorting tea powder off of the nostril-sized figurines, and waking up naked and confused next to zoo miniatures. "Hey, mom, looked what fell into my pocket!" My mother, horrified at what I'd become, made me go back to her friend's place and apologize. To my surprise, the friend said, "Oh, that's OK: you can have it." So, I took it back home and gave it a place of prominence in my Whimsies display. From that moment on, every time I looked at my figurines display, I remembered a valuable lesson: crime pays. Thanks, Red Rose Tea!